It’s amazing how things make their way into my hands where I can then share it with you. My Dad found these at a yard sale and snagged them for me. How thoughtful was that? 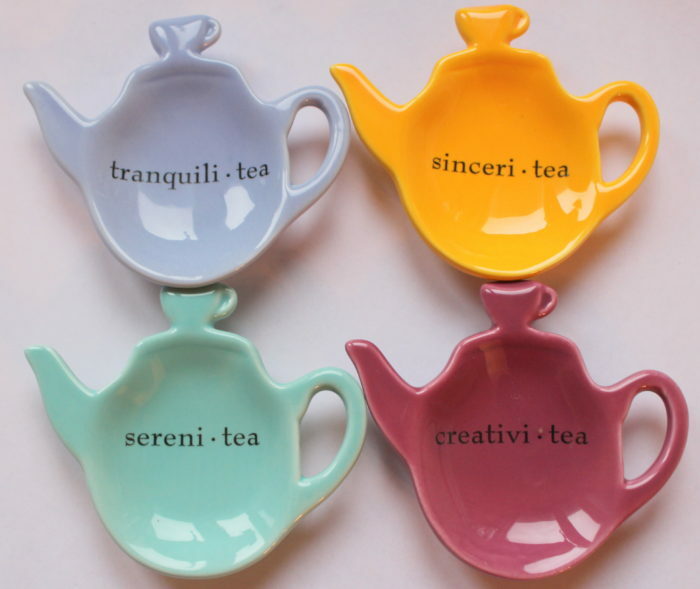 This is a cute little set of tea bag holders made by Atlanta-based Mud Pie for their Tea Talk line. The teapot design with a cup as the knob on the lid is exhibits a bit of “creativi-tea” and the play on words tickles me. Little holders like these save your table from stains and mess by catching drips from tea bags, tea infusers, and spoons. They’re also useful for serving dainty little lumps of sugar, slices of lemon, mint leaves or edible flowers. How else could you use them? ← Happy National Hot Tea Day! 2 Responses to Put It There! They are cute! You could use them to hold place setting names…small decorative cards with guests’ names? I think your ideas are excellent, though.